Spokane, WA signed onto the United Nations International Council for Local Environmental Initiatives (ICLEI) Climate Protection Campaign in 2001. Since then, the city has spent money, resources and time attempting to comply with the requirements of ICLEI. The rationale for the program was to comply with the United Nations sponsored Kyoto Protocol to reduce GHG emissions. The City of Spokane assumed that the United Nations IPCC made truthful statements about the effects of GHG emissions and especially carbon dioxide emissions on the earth’s climate. We now know without a shadow of doubt that the UN IPCC lied and is still lying about the effects of our carbon dioxide and other GHG emissions on climate. Spokane signed on to the United Nations ICLEI Climate Protection Campaign in 2001. Since then, the city has spent money, resources and time attempting to comply with the requirements of ICLEI. The rationale for the program was to comply with the United Nations sponsored Kyoto Protocol to reduce GHG emissions. The basis for the rationale is the United Nations Summary Reports for Policymakers of several years. The City of Spokane assumed that the United Nations IPCC made truthful statements about the effects of GHG emissions and especially carbon dioxide emissions on the earth’s climate. We now know without a shadow of doubt that the UN IPCC lied and is still lying about the effects of our carbon dioxide and other GHG emissions on climate. Most blatantly, the IPCC represented to the City a chart of the supposed carbon dioxide content of our atmosphere for the last 10,000 years. This chart claims carbon dioxide concentration was below about 280 ppm until present times and suggests that only recently have human emissions caused the carbon dioxide concentration to increase dramatically to the present 385 ppm. The IPCC further claims our emissions, if not curtailed, will cause carbon dioxide concentration to continue to increase with the result being a significant increase in global temperature. These IPCC claims are lies and a fraud. The truth shows that the City has been subject to this fraud of the highest order. This fraud has causing significant damage and harm to the citizens of Spokane and if continued, it will cause very serious damage. Indeed, it is the opinion of this writer that the City has a legal basis for a cause of action against those who have perpetuated this fraud. To respond to the carbon dioxide claim, true scientific data show that we had higher concentrations of carbon dioxide in 1820 and 1940 than we do now. True atmospheric science shows that we had periods in the last 10,000 years when carbon dioxide was much higher than shown on the IPCC ICLEI chart. True atmospheric science shows that ocean temperatures, not human emissions, control our earth’s carbon dioxide concentrations. True atmospheric science shows that carbon dioxide has negligible effect on climate, does not drive climate but only piggybacks on natural climate change. Prior to the promotion of the global warming fraud, the UN IPCC had access to scientific information that disproved its hypothesis that human carbon dioxide causes significant global warming. Nevertheless, the UN IPCC produced Summary Reports for Policymakers that ignored and contradicted the input of scientists. The IPCC claimed to have a “consensus” of scientists on its side when it did not and does not. Participating scientists who were betrayed by the UN IPCC Summary Reports wrote an Open Letter to the IPCC which states the scientific truth. UN IPCC reports do not represent the input, views or consensus of scientists. Changes in glaciers, sea-level, species, etc., are not evidence of abnormal climate change. Climate models cannot predict climate (even IPCC reps agree). Significant peer-reviewed research has discredited the global warming hypothesis. We need more low-cost, reliable energy to adapt to natural climate change. There is no scientific basis to cut CO2 emissions. It is not shown that CO2 alters climate. It is not possible to stop climate change. The “precautionary principal” is irrational. Reducing CO2 emissions is a tragic misallocation of resources. Reducing CO2 emissions will decrease our ability to adapt to climate change. Reducing CO2 emissions will increase human suffering. The earth warming is not due to CO2. Solar activity drives global temperatures. The 1500-year solar cycle is confirmed. The Pacific Decadal Oscillation, not CO2, drives temperatures. We are now entering 20-30 years of cooling. The IPCC global warming hypothesis is invalid. The UN IPCC, ICLEI and all supporting groups like the Sierra Club, knowingly and purposely perpetuated a fraud upon the citizens of the City of Spokane. Their purpose is their own political agenda. This sustainability proposal, and its companion proposals in some 400 cities across America, is but a small step to brainwash Americans into believing they must give up their abundant energy sources in order to save the planet. This is an evil delusion. Once these small steps are locked in, the agenda of our enemies will continue with the help of our laws, some lawyers, our brainwashed citizens and our elected politicians. This agenda, my dear friends, is nothing less than to dramatically reduce the standard of living of America and turn America into a third world country. The seemingly nice, feely-goody sustainability proposals are evil steps leading America to self-imposed destruction. Here are some of the invalid assumptions built in to the sustainability proposal. These assumptions are not supported by science or technology. These assumptions are brainwashing. Sustainability is built on a foundation of sand. It consists not of truth but of feelings. Sustainability is a religion. Governmental enforcement of a religion is against the First Amendment to the Constitution of the United States of America. 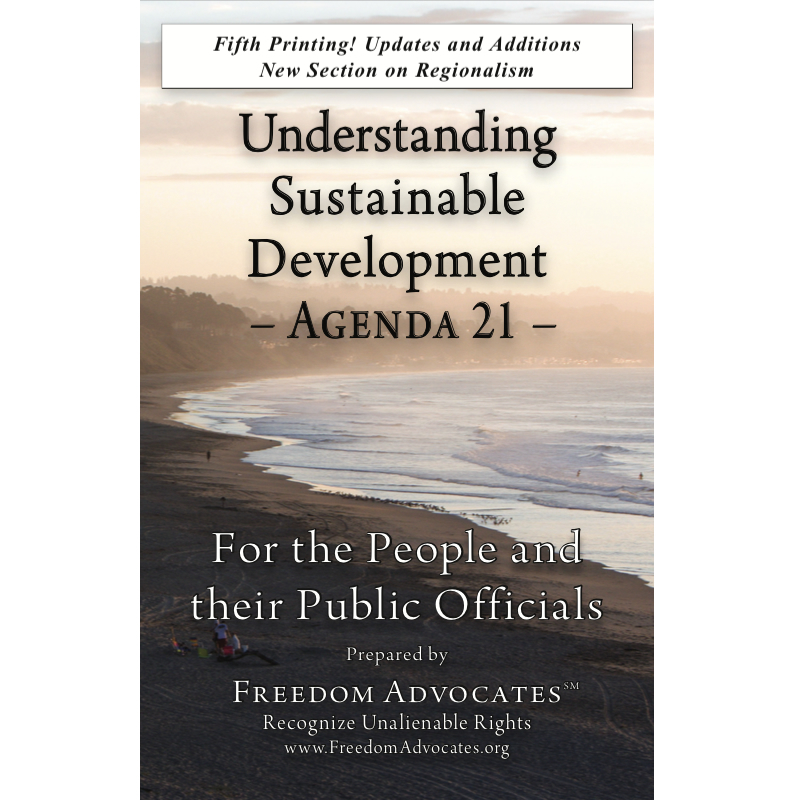 Sustainability forces decisions to be made on unfounded criteria. It forces decisions to favor more costly alternatives. In the end it will help destroy our economy. All of the above are costs that can be eliminated from government. They should be eliminated because they waste voters money. Damages from the fraud include all the direct costs to implement the ICLEI GHG agenda. They include indirect costs of the lost time and resources to pursue proper economic goals because of the diversion of the ICLEI agenda. They include the indirect costs of promoting wind energy as a substitute for coal, oil and nuclear. Wind energy would not be cost competitive without federal income tax credits. But the tax credits merely shift the cost burden from an electric bill to federal taxes. They transport wealth from the middle class to the super rich. A hidden cost of wind energy is the steel, concrete and transmission lines. A hidden cost is the investment necessary for utilities to rebuild their facilities to accommodate wind’s unpredictable, variable power source on the electric grid. A hidden cost is the permanent damage done to the land. If renewable means the ability to return nature and land to its original state then wind farms to not meet the definition of renewable. All these costs are ignored by the sustainability delusion. Do you see where this is leading? On May 11, the New York Times announced that China has emerged as a leader in clean coal technology. And “clean” does not here mean carbon sequestration. Clean means achieving 44% fuel efficiency while the best America has done to date is 40%. Clean means removing all the particulates, sulfur and undesirable emissions with the exception of carbon dioxide which is not really undesirable anyway. It helps plants grow and return the oxygen back to our atmosphere. Sequestered carbon dioxide never returns the oxygen back to our atmosphere. While the Sierra Club brags about stopping 82 of 150 of America’s planned coal-electric power plants since the year 2000 on the basis of the global warming fraud and boasts it will easily stop the rest under Obama, China is building one super efficient coal power plant per month. Do you understand what is happening? America could shut down today and stop all its carbon dioxide and other GHG emissions. Americans could disappear off the face of the earth. China, meanwhile, will continue to build its energy resources, and emit far more carbon dioxide than America saved by committing suicide. And in the year 2100 the self destruction of America and China’s carbon dioxide will not have changed the global temperature by 0.000 degrees from whatever nature has planned for the earth. The only thing that will have changed is America. It will be gone. Do you see where this train is going? China is on its way to becoming the world’s next superpower. America is on its way to becoming China’s next slave. Wake up, America. Continue as you are and within 10 years your dumbed-down Americans will supply the labor now being provided by China’s slave camps. You will build the world’s mercury-laden lamp bulbs and die after 30 years. You will support China’s new standard of living. China will own your National Parks, your national forests, your vast coal and oil reserves, your technology, your universities, and your house. China will be your master and you will be China’s slave. Your children will be crammed into your sustainability cities which will not be as pleasant as you may dream. Your masters won’t care if your garbage is removed or if you have hot water. You will not be free to drive to the country, hike in your hills, learn about the world or even to be educated. You will work six days per week in slave camps. You will be brainwashed animals who cannot escape. Gone will be your churches. Gone will be your freedom. You will know only the propaganda of their masters. All future generations of Americans will be slaves. Their only hope will be that some miracle will happen, that a future Moses will appear to free them. You who support the slippery path of sustainability, who are consumed by the global warming delusion, who pay no attention as your country slides toward self destruction, you are the useful idiots carrying out the plan of your world super masters. Somewhere in our beautiful but dangerous world the super masters are raising their glasses to toast their coming success in their little game: to bring down America as the world’s super power without firing a shot and to raise up China and make it America’s master. It is their little experiment. It is their power trip. We are but their puppets. Do you understand how to take control of a country? The way to destroy a country is to take away its energy production, remove its will to resist its own destruction, and to dumb down its citizens. We are so brainwashed, we are allowing these to happen. The final step will remove our ability to prevent our own destruction. At some point, we will be unable to defend our country and our homes. Get off the train now before it reaches its destination. You can vote YES to perpetuate the global warming fraud, sponsor an earth worship religion, and to send Spokane and America to its eventual destruction. Or you can vote NO to become the first city in America to reject the sustainability fraud and send Spokane and America on a path to enlightenment and recovery. NO is a vote for Good. YES is a vote for Evil. Spokane, you can save America. This article contains links to outside sources not controlled by Freedom Advocates and therefore are subject to change.